The Revo Burst is a highly energetic lighting effect that utilizes 7 clusters of 42 LEDs each (total of 294 Red, Green, Blue & White LEDs) that strobe and turn on/off in a synchronized way as to look like fireworks, all from the units built-in programs. Shine the Revo Burst on a ceiling, wall or on the floor with or without using fog. This lighting effect has a wide beam (46 degrees) angle so you do not have to hang the unit very high off the ground to get a large amount of coverage. The Revo Burst is light-weight,compact and designed for the entertainer on the go. The unit has no moving parts inside and offers 100,000 life expectancy on its LEDs. Run the unit is sound active, master/slave with other units, or customize a light show using a DMX controller. The ADJ UC3 easy-to-use hand-held controller may also be used to turn the unit on and off and run through the various built-in lightshows. 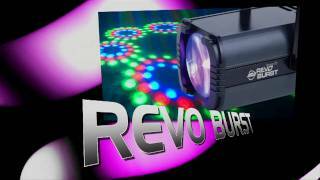 Considering purchasing the American DJ Revo Burst DMX LED Effect? Have questions? Ask people who've recently bought one. Do you own the American DJ Revo Burst DMX LED Effect? Why not write a review based on your experience with it. Very bright LED Moonflower effect - I have 2 that I connect together via a DMX cable. Together they fill medium to large rooms with pin sharp beams - I use on sound to light only and the effect is superb, even without smoke. Also very light for transport. Seen a video for American DJ Revo Burst DMX LED Effect online or have you own video? 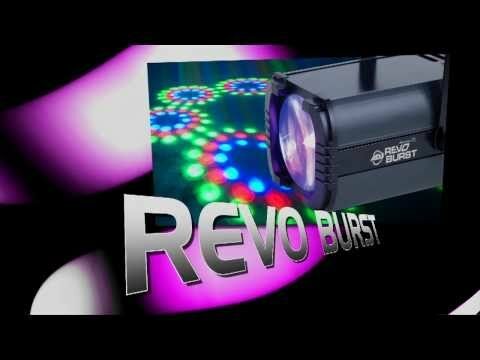 Check out American DJ Revo Burst DMX LED Effect on DJkit.com!